Combining heavy-duty turning and milling in one setup, this compact VMC is a 5-axis lathe/turning center with a high power/high torque motor for quick start up of both milling and turning spindles, and has a rapid traverse rate of 1,575 ipm. 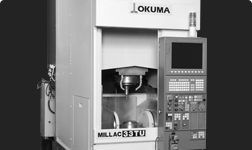 MILLAC 33TU has exceptionally strong spindle clamping force for heavy milling operations, and the high-speed, automatic tool changer has a tool-to-tool time of 1.4 seconds, with 3.5 second chip-to-chip time. A hang-down magazine located between columns reduces tool preparation time, and proven box type construction reduces vibration and tool chatter during even the heaviest cuts. Heavy-duty 3-axis vertical lathe/machining center ideal for heavy milling.